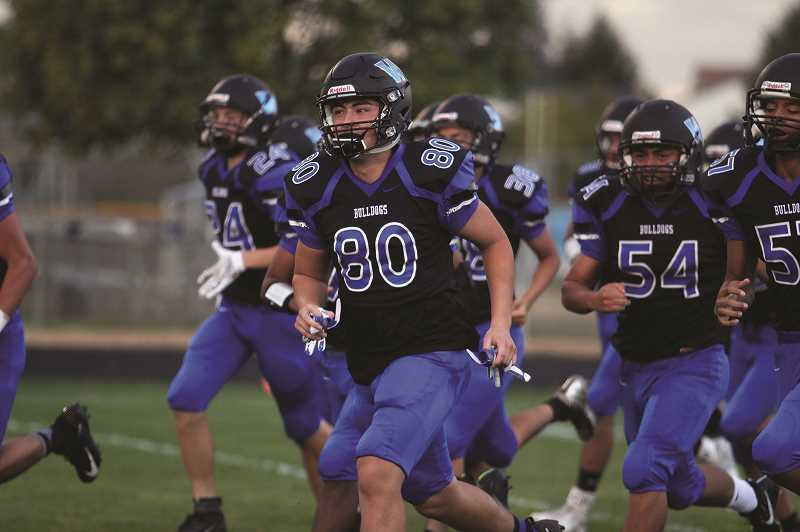 In his seven years as Woodburn football coach, Nick Federico has never seen the Bulldogs play like they did in the team's 60-40 win over the North Valley Knights on Thursday night. 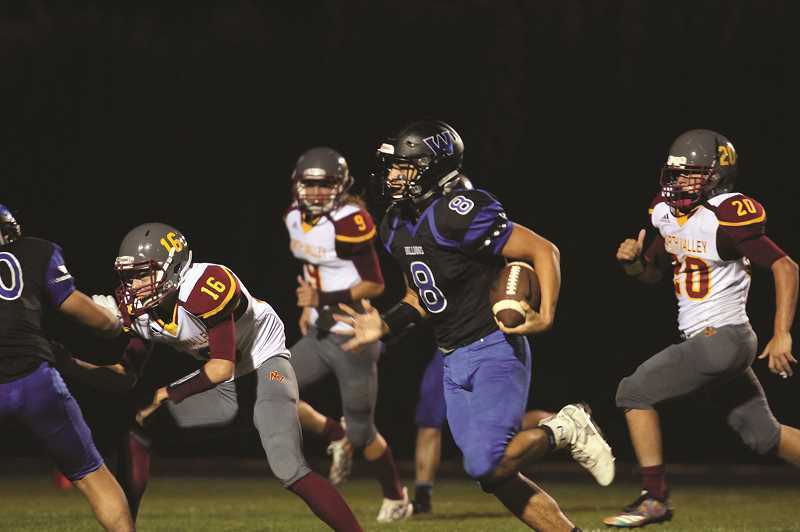 Sure, the Knights put up a score that normally would have beaten Woodburn on any given night in the past, but the way Federico's team was playing, it seemed that every North Valley touchdown was answered with two more by the Bulldogs. "If you told me we give up 40 and we win, I'd say deal," Federico said. "I'll take that. I've never seen 60 on the board, and for that to be, that's awesome." In fact, the last time Woodburn put up more than 60 points was in the 2011 season when the Bulldogs defeated the Benson Techmen 69-40. That was the only year in the 21st century in which the Woodburn football team didn't have a losing record (they went 5-5) and qualified for a post season game (they lost 33-22 to Bend in the play-in round). Certainly a good omen as this year's Bulldogs begin their long-awaited foray into the 4A Classification. "We saw this coming; the kids saw it coming," Federico said. "They believed. It's been very special and the kids have done great." It was a jarring turnaround for a Woodburn team that has long had difficulty scoring the ball. The Bulldogs' 60 points on Thursday are more than half of what the program scored last year and nearly matched the entire 80-point output the team scored in 2015, the last time Woodburn played a conference schedule. Federico credits much of the production to the team's camaraderie in the face of strong positional competition, particularly at quarterback where the Bulldogs feature two new senior signal-callers fighting for playing time. 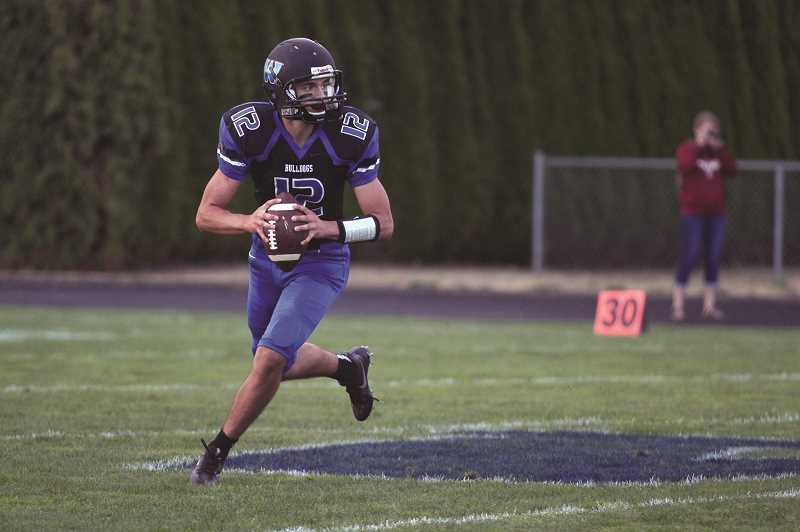 Nate Corpuz entered the summer season as the team's prospective starter at quarterback after transferring to Woodburn in the middle of the 2017-18 athletic season. But the Bulldogs got a surprise addition late this summer when R.J. Veliz joined the program for his senior season after playing his previous three years at Blanchet Catholic. Faced with two athletes competing for one position, Federico did what any coach would do — play them both. As Veliz took snaps behind center during Thursday's win, Corpuz spread out wide to receive passes. In alternating series, Corpuz would take the helm at quarterback while Veliz would line up at receiver. "Everybody just wants to see the other person succeed," Federico said. "To see them throw passes to each other and be excited for each other — you can't fake, and that's the beauty of it." The pairing worked extraordinarily well for the Bulldogs against North Valley. Veliz stole the show, rushing 14 times for 197 yards and four touchdowns while completing all three of his pass attempts for 103 yards and a touchdown. But Corpuz put his stamp on the game too. Veliz's lone touchdown pass came courtesy of a 31-yard strike to Corpuz, who caught the ball 15 yards past the line of scrimmage and streaked across the other side of the field for the score. Corpuz also made his presence known to the Knights, finding senior E.J. Barajas on a 67-yard touchdown pass at the end of the second quarter. He finished 2-of-3 for 87 yards and a touchdown. His lone incomplete pass — the only incomplete pass thrown by Woodburn the entire game — was an interception at the end of the first half that had little impact on the outcome. 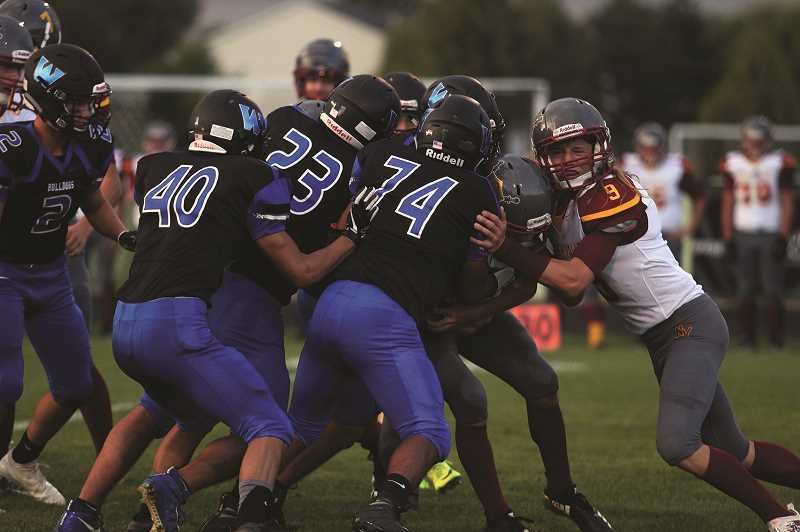 Corpuz and Veliz also connected on a pair of two-point conversions, as Woodburn successfully converted six of eight attempts against North Valley. "They're in one of the most heated competitions at quarterback, and it's easy to not like the other person," Federico said. "The fact that they threw a touchdown and they're over there celebrating, high-fiving and enjoying it, it says a lot about who they are as people, competitors and teammates." The other notable contribution on offense came from junior Dyontae Navarrete. Though his biggest play, a 44-yard touchdown run, was called back due to a holding call, he still finished with 10 carries for 97 yards and two touchdowns. That said, the game wasn't firmly in hand until the fourth quarter. Woodburn took a 38-20 lead after the first series of the third quarter, but the Knights came right back with back-to-back touchdowns to move within 38-34. But the Bulldogs answered again, courtesy of Veliz, who marched 62 yards down the field in three plays to score his third touchdown of the night. After an interception by Woodburn senior Adam Laursen stopped North Valley's next drive, Veliz added another touchdown run to firmly put the game out of reach. Woodburn (1-0) will look to bring its momentum down to Junction City on Friday against the hosting Lions, though hopefully with a little less given up on the defensive side. "The defense will catch up and we'll get tougher," Federico said. "But for our offense to be firing like that, that's awesome for the next team we play. Because what do you defend?" Woodburn (6:02) -- Dyontae Navarrete 1-yard run (Veliz to Laursen good). North Valley (9:37) -- 13-yard touchdown run (2-point failed). Woodburn (8:06) -- R.J. Veliz 2-yard touchdown run (Veliz to Corpuz good). Woodburn (2:44) -- Dyontae Navarrete 45-yard touchdown run (2-point run failed). North Valley (1:28) -- 11-yard touchdown run (2-point good). Woodburn (1:06) -- E.J. Barajas 67-yard touchdown pass from Nate Corpuz (Corpuz to Veliz good). North Valley (0:29) -- 12-yard touchdown run (2-point good). Woodburn (10:10) -- R.J. Veliz 29-yard touchdown run (Navarrete run good). North Valley (5:33) -- 4-yard touchdown run (2-point good). North Valley (2:57) -- 13-yard touchdown pass (2-point failed). Woodburn (2:08) -- R.J. Veliz 3-yard touchdown run (2-point good). Woodburn (8:42) -- R.J. Veliz 6-yard touchdown run (2-point no good). Woodburn (5:32) -- Nate Corpuz 31-yard touchdown pass from R.J. Veliz (Navarrete 2-point run good). North Valley (2:33) -- 22-yard touchdown run (2-point no good).